Delcam will show the latest developments in its ArtCAM JewelSmith CADCAM software for the jewellery industry on booth 917 at the JCK Toronto exhibition to be held from 13th to 15th September. 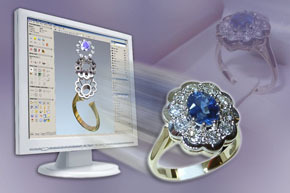 ArtCAM JewelSmith is an integrated design and machining software program created for jewellers to create intricate custom jewellery pieces or complete jewellery lines. Known for its ease of use, ArtCAM’s structure utilizes a number of layers to represent different elements of a design, or to form intricate and complex patterns. Tools like the ‘Project Tree’ can help keep all the related models together for quick and accessible design of a family of jewellery. Duplication of any design element into another jewellery piece (for example from a ring to a bracelet or necklace) can be implemented very quickly. To incorporate gems into the jewellery design, JewelSmith quickly and efficiently takes the dimensions of both calibrated and un-calibrated gems and creates caps to securely hold them in place. This saves the jeweller’s time and allows him to focus his knowledge and skill on developing other design ideas. Modelmakers can sculpt their designs, either by using ArtCAM’s sculpting toolbox or by customizing their own sculpting brushes using imported textures or their own designs. For hand engravers, ArtCAM can replicate their current working methods by utilizing a Wacom tablet. With this device, as more pressure is applied by the pen to the tablet, more material can be removed from, or added to, the design. An important new feature for producers of corporate giftware is the ‘Embossing Tool’. To create a coin pendant, for example, the user can take a 3D model and tilt or rotate it to give the required perspective, creating the illusion of distance between one area and another. Within seconds the ‘Embossing Tool’ then reduces the model’s depth to those typically used for coinage while maintaining the prominent details and illusion of depth from the original model. Future developments scheduled will be seen in ArtCAM 2010, due to be launched in October of 2009. These will include a new modernized graphical user interface, more direct interactivity with 3D models, and improvements to the core performance by utilizing CPU multi-threading.